Samsung celebrates their game 2 victory over KB Stars. They will meet Woori Bank in the Korean League Finals. KB Stars entered game two of the Korean League semi-finals in a must win situation as they lost game one on the road by five points. With just one day in between games, both teams had to quickly regroup and prepare for game two. At home, KB looked to turn things around but Samsung had other plans. Samsung took the lead early and never looked back. KB at times looked fatigued as Samsung continued to push the ball up the floor. Again it was Alyssa Thomas and Kimberly Han who took on the scoring load for Samsung. Thomas finished the game with 25 points and 11 rebounds while Han had 26. Pierson did all she could for KB, pulling down her second double double of the series but it was not enough. Rookie sensation Ji-soo Park also finished with a double double. The future looks bright for KB Stars with Park at the helm. Samsung will face Woori Bank in the Korean League finals which begin on Thursday March 16th. 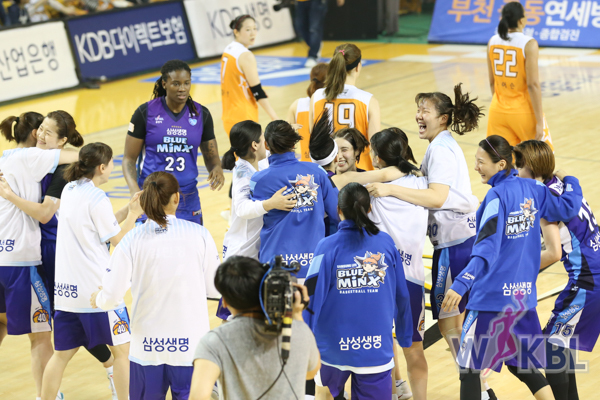 Woori Bank went undefeated against Samsung this season but anything can happen in the finals! There is only one day between games in a best of five series. The first two games will be played at Woori Bank’s home gym in Asan on the 16th and the 18th. Game three will be in Yongin on the 20th. Game four, if necessary, will also be played at Samsung’s home gym and game five, if necessary, will be back in Asan.